This is the second year Laurel Hill Cemetery has asked Jefferson lighting students to illuminate its annual tour. Industrial design and architecture students will help light up the night at Laurel Hill Cemetery’s Halloween Soul Crawl: Haunted History Tour this weekend. 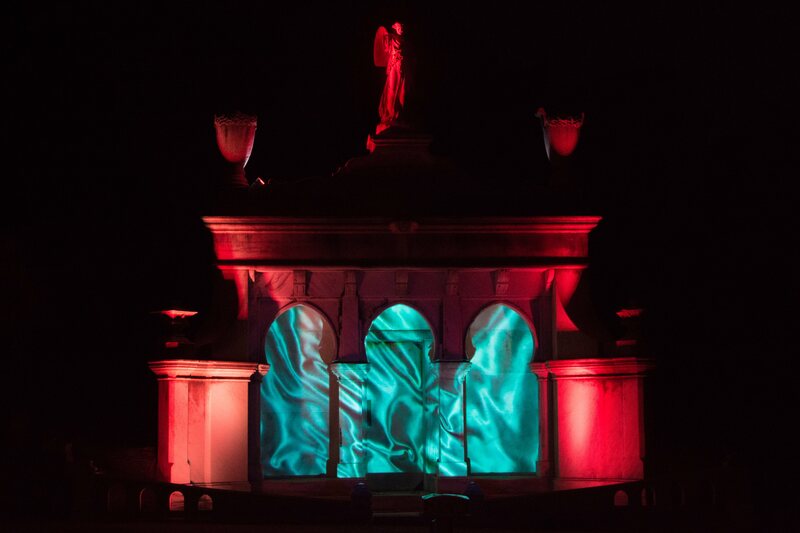 They created six different stations throughout the cemetery—including the mausoleums and an assortment of monuments—that will feature vibrant and haunting light shows. Fourteen students worked on the event as part of a class project in the Lighting as Public Experience course taught by Lyn Godley, associate professor of industrial design at Jefferson (Philadelphia University + Thomas Jefferson University). This is the second year Laurel Hill has asked the lighting students to illuminate its annual tour. At the Soul Crawl, guests go on flashlight tours along winding, dimly lit paths and hear stories of the cemetery’s rich and spooky history. The Halloween Soul Crawl: Haunted History Tour takes place Friday, Oct. 19 and Saturday, Oct. 20 at 7 p.m. For more info and to buy tickets, click here. Jefferson students with ID can purchase discounted $12 tickets.